These mudguards come as a set of front and back together with the mudguard stays required to attach them to your bike. 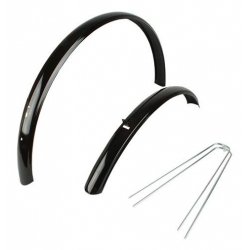 They are of the traditional steel type used on many traditional and Dutch bicycles. They're available in sizes to fit bicycles from childrens' sizes upwards, with the size of the mudguards specified as the matching wheel size inches, though we've provided ETRTO measurements for wheel size as well (read our blog post which explains about wheel sizing). The wheel size is followed by the mudguard width in millimetres.